Burntisland supporters, including police, councillors and residents. Pic by George McLuskie. 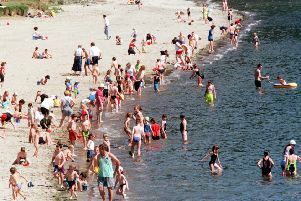 Residents in Burntisland have been lining up to sing their town’s praises after a recent spate of bad publicity. Reports of gangs of youths causing chaos and attacking people in the streets, coupled with stories of antisocial neighbours abusing locals have cast the seaside town in a bad light in recent months. But dozens of local residents have taken to social media to voice their love for their home town, and they are calling on people not to let a tiny minority spoil it for the vast majority of law abiding citizens who are very proud of where they live. And many have added their support, listing the things about Burntisland that they love to a post on the town’s Facebook page. Police officers overseeing the town say that there has been no major rise in the number of incidents reported to them. However they acknowledge that because they were filmed and posted online, they have been more high profile and reached more people. Officers will continue to patrol problem areas. Iain Ralph, chairman of the Central Burntisland Tenants and Residents Association, said: “Antisocial behaviour has been going on for years but it doesn’t detract from the fact that this is a great place to live.